Lego’s video games have generally been extremely fun, family friendly games; all of which cater to a very specific universe and IP like Marvel Superheroes or Lord of the Rings. That is set to change with the announcement of Lego Dimensions, a Disney Infinity style game with collectable figures on NFC bases. The starter pack will ship with a Lego Toy Pad which functions in the same way as the NFC reader from games like Skylanders or Amiibos. Naturally, the Lego twist exists and players will be able to physically build a Lego portal onto the device. Naturally, this also invites some customisation as it happens to be compatible with regular bricks. This starter pack will also ship with three figures: Gandalf, Batman, and Wyldstyle; as well as a smaller Lego Batmobile. It looks like these figures are stuck to their bases, which is a little disappointing. There really is nothing worse than a minifig that cannot interact properly with other Lego sets. The rest of the set will be sold in Level, Team, and Fun packs. Level packs will contain one character, two vehicles, and one game level. There is only one known Level pack so far, and it looks like Lego will take its time releasing these. Despite this, the fact that the first Level pack is a Back to the Future set makes it very tempting. Team packs will contain one character and two vehicles and, again, there is only a single Ninjago set announced. On the other hand, Lego has announced 13 Fun packs; these feature a single character and its accompanying vehicle. These include characters from the Lord of the Rings (like Gimli and Legolas), more Ninjago, Lego Movie, DC Universe (both Wonder Woman and Cyborg are set to appear), and the Wicked Witch of the West. 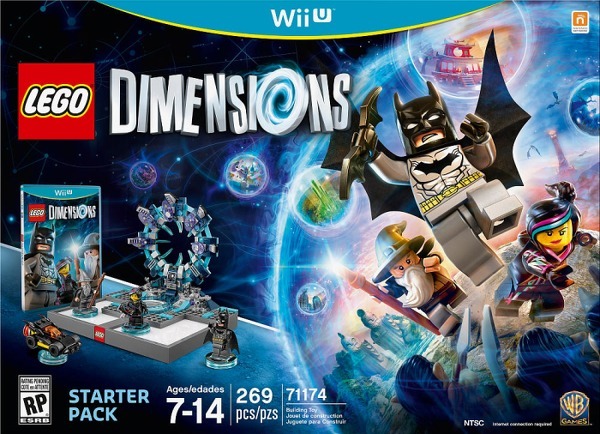 Lego Dimensions will be released for the PlayStation 3, PlayStation 4, WiiU, Xbox 360, and Xbox One in September. Like the other collectible games of this kind, it won’t be cheap. The starter bundle alone will cost US$99.99 (about RM364) according to the Toys R Us website.